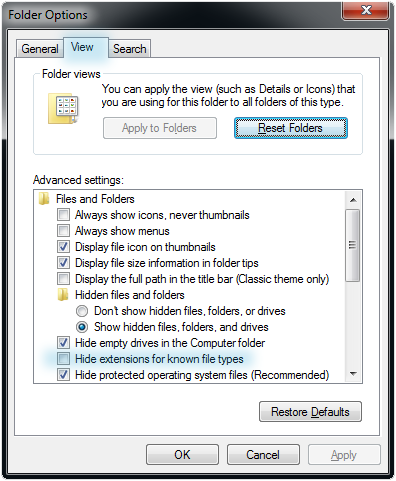 By default, Windows Vista hides file extensions from view. it is important to know what file extensions mean and how your computer uses them. When faxing via the internet, you will become familiar with file extensions every time you send or receive a fax. Sometimes you will need to view these extensions in order to change them. This page contains instructions on how to show the file extensions. To display file extension, clear the Hide extensions for known file types check box, and then click OK. Learn more about file extensions.